Adams Schoolhouse (Huffmantown Road) circa 1902: The Teacher standing on the left is Walter Paderick. This one room school operated from about 1892 until 1924. All children of Mary and Arthur Cox were educated here. The school students still hold reunions. I attended a reunion first in 1987 - and two of the teachers were present! The color photo below was taken in 1994. The school was partially destroyed by hurricanes Bertha and Fran in 1997 - but restored in 2001. The above information is from Dennis E. Jones, principal of Richlands High School. WHERE WERE YOU IN 1902? "This is the The Adams School House, its teacher, and, pupils as they appeared in 1902, The, old building still stands about three miles north of Richlands on Rural Road 1302. The picture and information was furnished by Mrs. Lena Huffman Marshburn. Mrs. Marshburn was not born until four years after this picture was taken, but three of her sisters and two brothers are in it. Mr. Tim Huffman says at the time this picture was taken they went to school two months out each year-June and July. This was because tobacco was not prevalent at this time. When Mrs. Marshburn started school in 1910 there were four months of school. It had been changed to winter months. Nov - Feb. so the children could work on the farm. (2) Guy Saunders (deceased) was the uncle of J, Garland Metts, Rt. 2, Richlands. 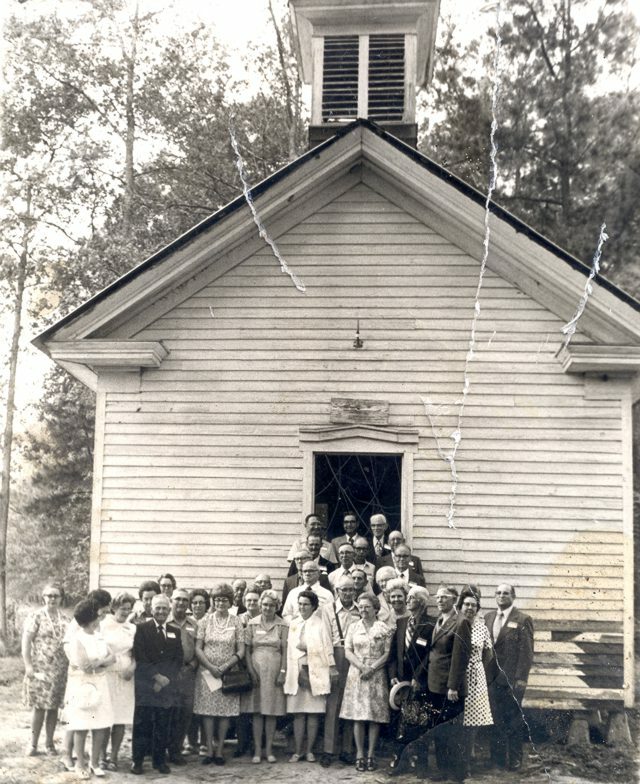 Saunders was the minister of the First Christian Church Eden, N.C. for about twenty-five years before his death in 1972. (3) Eva Barbee Shaw, is the mother of Virgil. Rueben, and Kathleen Shaw of Richlands. (4) Thomas Huffman (deceased), was the father of Clement and Bryant Huffman and Mrs. Luby Marshburn of Richlands. (6) Minnie Huffman Foster (deceased) was the mother of Fannie Nicholson of Comfort who works in the Richlands Post Office. (7) Albert Huffman (deceased) was the father of A.J. Thurman and Garland Huffman of Rt. 2, Richlands; Drafferd Huffman, Evylen Amabile, and Magdaline Heath, of Jacksonville. He was the grandfather of Morris, Jerry and Kenneth Huffman of Jacksonville. (9) Tim Huffman. still active at 94. is the father of Harold Huffman and Marie Stanley of Richlands. (10) Nannie Huffman Daniels (deceased). (12) George Frank Huffman (deceased) was the father of T.G, Huffman of Chinquapin, Betty Bryant of Jacksonville and Mary Von Huffman Johnson of New Bern. (14) Simon Taylor (deceased) was the father of Etta Taylor Farrior of Richlands. (15) Bessie Huffman (deceased) was the mother of Edmond Huffman of Comfort and Annie Mae Wiggins of Comfort. She was the maternal grandmother of Mrs. John Jones, the wife of the Parkwood School Principal. If you can identify any of the others pictured here or make corrections of those identified, please contact The Herald." - Walter Paderick (no. 1 in photo), the teacher, is the Father of Aunt Evelyn Paderick Cox - married to Uncle Reuben Crispus Cox. He is the Grandfather of (cousins) Poe, Eleanor, Alice and Orville. - Abner Huffman (No. 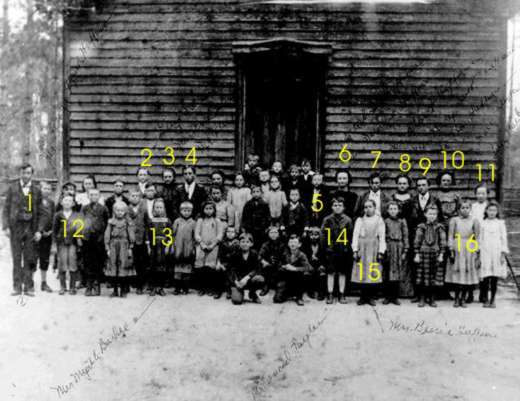 7 in photo), a student, was the Father of Uncle Garland Huffman AND Uncle Drafferd Huffman. Garland and Drafferd were brothers who married Cox sisters. Uncle Garland married Aunt Julia Grace Cox and Uncle Drafferd married Aunt Esther Josephine Cox. Garland and Julia Grace’s children are (cousins) Barbara Dumphy, David Huffman and Lynn Huffman. Drafferd and Esther’s children are (cousins) Ann Radek, Morris, Kenneth, and Jerry Huffman. Donations can be given to help restore the school house. Many thanks to Susan Perdergraph for identifying her grandfather as the man on the left who was the Adams schoolteacher, Joseph Parsons Brown. His hat is quite fashionable. The photo was taken circa 1912 or after (in the morning based on the Sun shadows and on a cool day based on clothing with hands in pockets) since Parsons Brown began teaching there in 1912. Note the suit and tie clothing for the teachers. The school was painted white by this time. There were 36 students. Persons having history information, relics, stories, or photos about the Adams School are asked to contact Dennis E. Jones at dejones@coastalnet.com or Hugh Cox at webmaster@coxhistory.com so that a separate website with much more information can be established.